Tonight: Mild and increasingly muggy. Lows around 70. Monday: Hot and muggy. Late t’storms. Highs in the mid 90s. Tuesday: Morning t’storms, clearing out. Warm and muggy. Highs in the low 80s. A strong sea breeze dropped temperatures along the coast from the low 80s to the mid 70s during the day on Sunday, while inland locations made a climb into the upper 80s and low 90s, but the hottest day of this current stretch is coming up on Monday. 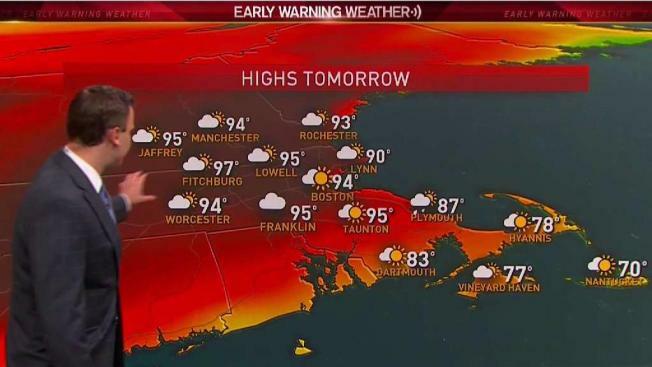 The NBC10 Boston/necn weather team was never on-board when it came to the potential for extreme heat on Monday. There is no question it will be hot, but it certainly won’t be atypical. Records may be set, but the heat and humidity are relatively average for late Spring. Our hottest days usually occur during July and August and with a Southwest, West or Northwest wind. It’s June and out wind direction will be out of the South, Southwest. The normally warmer valley locations may reach the upper 90s, but that too is fairly typical for late Spring. Regardless, it will be hot, so remember those heat safety tips. Thunderstorms are likely Monday evening and night. Not all atmospheric conditions point to a huge outbreak, but this is generally the set up where we see scattered severe thunderstorms. At this point, isolated gusts to 60 mph and a lot of lightning is possible. Thunder and clouds clear Tuesday. The remainder of the 10-day forecast is pretty nice. We’re expecting a good deal of sunshine, relatively low humidity and seasonably warm weather. Showers are also possible, but our need for a soaking is climbing each day.